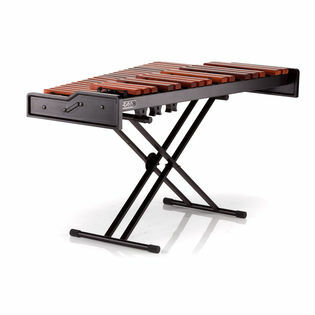 The Adams AMPD30 3.0 Octave Padouk Wood Bar Marimba is designed to offer exceptional quality of sound to a broad range of players. Ideally suited for young percussionists, the Academy Series Marimba sets up easily on a table top or with the included X-style stand. The Academy Series instruments feature a patent pending Integrated Resonator Rail System that provides not only a quality bar suspension and box resonator format, but also the rigid Aluminum Beam structure that makes these instruments the most durable in this class on the market. Finally, educators the world over will have access to a high quality wooden bar instrument at an affordable price. Students will get a head start with their love of percussion. This is a good marimba for learning percussionists. It's portable and loud. The resonation is ok,I'd get louder mallets,but overall it is great :) good for drum set and marimba duets. I like the size of the bars but not the tone. The instrument actually fell on one of my middle school students during a rehearsal. The frame is not that sturdy. The design is not set up for the body of the instrument to lock in to the frame therefore compromising its stability. Great instrument for the price. The lack of resonators is apparent as soon as you start playing. Fundamentals in the lower register don't speak as well as a marimba with resonators - but overall, it sounds great. I bought this marimba for use in a rock band. I needed something that was easily portable and loud - this instrument is both. The mallets that are included don't really do it justice. I tried DS18s and Encore 23LBs which make it speak much better. The range is good (C-C) - I don't miss the top octave, but I do miss the low A. Graduated bars are a nice feature as well. The perfect instrument for gigging. Overall, I am really happy with this marimba.